Google yesterday announced that the Google Keyboard will be available as a downloadable App for Android devices. Though the new keyboard may not be as good as Swype or a SwiftKey keyboards already available for Android devices, but knowing Google, these guys now have a serious competition. The announcement came through a Google+ post which said that the new keyboard will offer "Gesture Typing". Gesture Typing in Google's words is Typing which lets you glide through letters to form a word, just lift your finger to enter a space. Google also said that the keyboard will have automatic error correction, and word predictions. You can also tap the microphone to compose messages with Voice Typing when you’re on-the-go. Together with dictionaries for 26 languages (plus keyboard layouts for a dozen more), it provides a fast, accurate, and reliable typing experience. The best is yet to come from Google for this is just a foray into the world of keyboards. 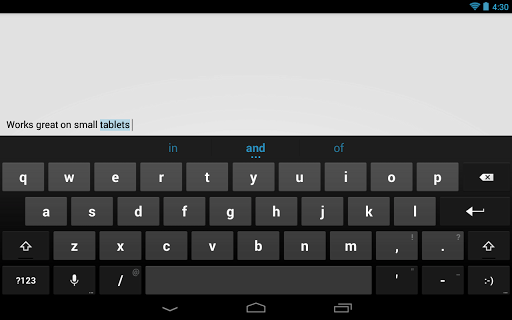 However one issue I have with the new keyboard is that it is available only for Android devices running 4.0 and up. This being Google's own product, it could have made the keyboard support available for Android devices starting 2.3 and up as majority of low budget smart phones still fall in that category. However that does not take away anything from the Google for out thinking and out smarting the competition, namely SwiftKey and Swype who will soon feel the heat of the search giants entry into keyboard Apps. Right now the Keyboard is available to English speaking countries and other languages will be added soon. To download your Google's own Android keyboard visit Google Play here.